I Herewith send you an Account of the House of Maintenance as it is called here. For the Year 1726, we paid £598-09-01½ including upwards of £100 for Rent and Fuel. AND since Lady-Day last, they have cost us about £210. 3 Men, infirm and incapable of doing any thing. 12 Women, most of them very antient, and two blind. 32 Children, from 2 to 10 Years of Age. 7 Others between 10 and 12. ALL that are able are employed in Washing, Baking, Brewing, Nursing, and cleaning the House; and the Children that are capable knit Hose for the Family. AND though Bread Corn has been very dear; and a great Sickness, with a Fever and Ague, has increased our Poor very much during last Year, yet we have maintained out Poor from Michaelmas 1727. to Michaelmas 1728, for about £395. So that upon a Comparison of our present Expence, with those in the Years 1725, and 1726 we save upwards of £200 per Annum, and the Poor are better taken Care of. A parliamentary report of 1777 recorded parish workhouses in operation at Chertsey (with accommodation for up to 70 inmates), Chobham (30), Walton upon Thames (50), and Weybridge (20). A property on Red Lion Lane in Chobham, now known as Jubilee Cottages, served as workhouse for the parish. Chobham old workhouse site, 1914. Surrey: Bisley, Byfleet, Chertsey (4), Chobham (2), Horsell, Pyrford, Walton-on-Thames (2), Weybridge, Windlesham and Bagshot (2). Later additions: Thorpe (from 1894). The population falling within the Union in 1831 had been 13,369 — ranging from Bisley (270) to Chertsey itself (4,795). The average expenditure on poor relief for 1833-5 had been £8,307 or 12s.5d. per head of the population. A new Chertsey Union workhouse was built in 1836 at Ottershaw on the south side of Murray Road. Its location and layout are shown on the 1870 map below. The building was designed by Sampson Kempthorne who was also the architect of many other early workhouses built in the wake of the 1834 Poor Law Amendment Act. Chertsey workhouse was based on his model hexagonal plan with an entrance block facing the road behind which three wings radiated from a central hub in a Y-shape. The areas between the wings formed exercise yards for the different categories of inmates and were surrounded by perimeter walls forming a hexagon-shaped perimeter. 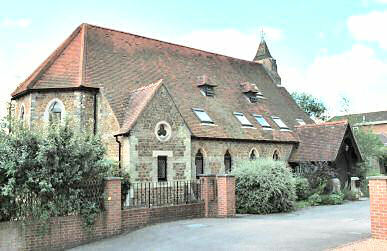 A chapel was erected at the west of the workhouse in 1868. Fever wards were built in 1871 and a mortuary and tramp wards were added in 1883. In 1894, an infirmary was built at the south of the workhouse, together with accommodation specifically for children. Chertsey entrance block from the north-west, 2001. Chertsey chapel from the north-east, 2001. By 1914, many of the outbuildings forming the original hexagonal perimeter of the workhouse had also been removed as shown on the map of that date. 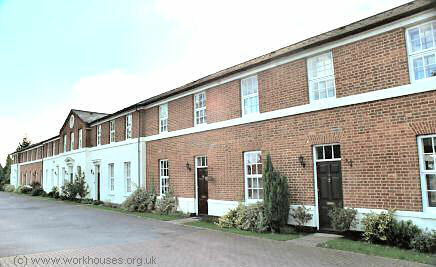 In 1930, the workhouse was taken over by Surrey County Council and later became Murray House Certified Institution for the Mentally Defective. Most of the former workhouse buildings have now been demolished. The entrance block and chapel survive, both having been converted to residential use. By the 1920s, the Chertsey Union had established a children's home at Ottershaw, exact location undetermined. In 1924, it could accommodate 18 children, with Mr E.E. Summers as its Master. Surrey History Centre, 130 Goldsworth Road, Woking, Surrey GU21 6ND. Holdings include Guardians' minutes (1835-1874, 1876-1930); Admissions and discharges (1894-1932 with gaps); Births (1866-1914); Deaths (1867-1932); Garden and pig accounts (1924-32); etc.